If India’s many cryptocurrency exchanges are stunned after RBI’s announcement yesterday banning banks from dealing with them, they aren’t showing it. Most of India’s cryptocurrency exchanges have maintained a stony silence after the RBI mandated yesterday that authorities it regulates — chiefly banks — would no longer be allowed to conduct business with entities that dealt with virtual currencies. This meant that users, in all probability, would be unable to use funds in their accounts to buy cryptocurrencies, or sell cryptocurrencies that they already own in exchange for Indian Rupees. While the order will take effect in three months, it could essentially mean a ban on cryptocurrency trading in India. But India’s many cryptocurrency exchanges haven’t come out with their statements on the issue, even as worried users have been hounding them to providing them with clarity on what’s going on. 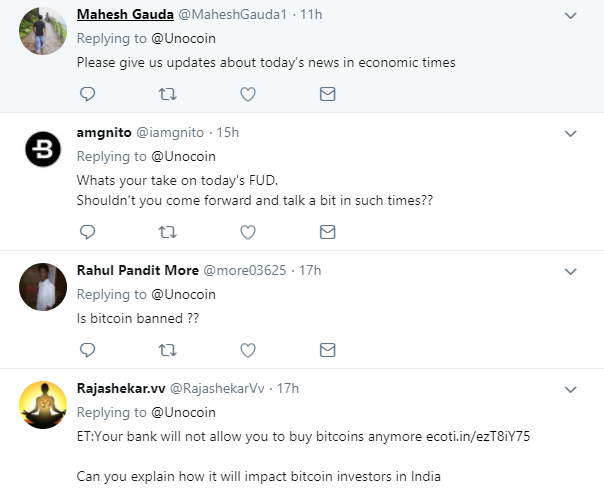 Unocoin, one of India’s largest crypto exchanges, regularly shares information on Twitter, but its last tweet has been an article comparing bitcoin to oil. Users have responded to the tweet, asking the company to help them understand what’s going on, but Unocoin hasn’t replied. Things are similar at Koinex, another large crypto exchange. 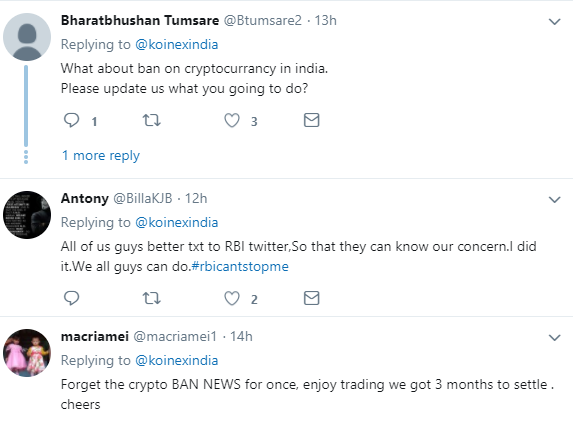 Koinex’s last tweet is an announcement for a contest it’s running, but users aren’t interested — many users replied to the tweet asking Koinex on what the RBI ban meant for their usage. Koinex, too, isn’t saying much. Zebpay, one of India’s oldest crypto exchanges, was being asked similar questions, but there has been no statement from the company. Its CEO, Ajeet Khurana, however replied to a tweet saying that there was no way he was stopping services, and said he was studying the situation. One of the more detailed responses came from Nischal Shetty, founder of crypto exchange WazirX. In a detailed blogpost, he acknowledged that the RBI’s circular had come as a blow. “The announcement today mandating banks to not allow people or businesses in India to deal with cryptos may push us back in time and make us all miss this golden opportunity,” he wrote. He bemoaned how the order would cause massive wealth erosion among India’s crypto community. “Thousands of Indians who may have quit their jobs because they have been earning well as crypto traders now have nowhere to go. They’ll be left without jobs, without a source of income,” he said. He then urged the crypto community to come together to make its voice heard by the authorities. It’s unlikely if that will happen — the Indian government has long been circumspect about cryptocurrencies, regularly warning users against investing in them, and saying in December that crypto exchanges had no authorization or license from the government. Other authorities had been tightening the noose too — the IT department had raided the offices of bitcoin exchanges in December on suspicions of tax evasion. All this hadn’t stopped India’s crypto enthusiasts from continuing to invest in virtual currencies, but the latest order can take matters out of their hands. With banks now not allowed to deal with crypto exchanges, their investments have been dealt the most serious blow yet. And with most exchanges currently unresponsive on how the move will impact their operations, they’re uncertain about what future awaits their cryptocurrency investments.